Purpose: Solid pseudopapillary tumor (SPT) of the pancreas is a rare clinic entity, representing 1-2% of all exocrine pancreatic tumors, and occurs predominantly in young aged female. In children, pancreas tumor is very rarely developed and only fewer than 100 cases of pancreas SPT have been reported in the literatures. Moreover the reported cases of pancreas SPT treated by laparoscopic resection in the children are extremely rare. 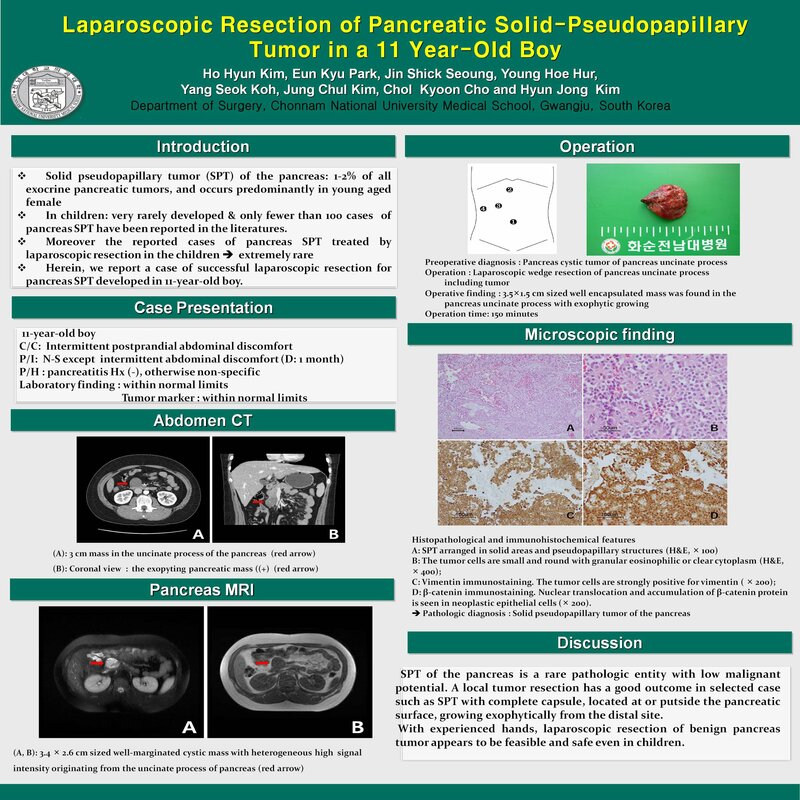 Herein, we report a case of successful laparoscopic resection for pancreas SPT developed in 11-year-old boy. Case: The patient was a 11-year-old boy who complained of intermittent postprandial abdominal discomfort. All laboratory values including tumor markers were within normal limits. Pancreas MRI revealed a 3.4 × 2.6 cm sized well-marginated cystic mass with heterogeneous high signal intensity originating from the uncinate process of pancreas. The patient underwent laparoscopic wedge resection of pancreas uncinate process including tumor under the impression of pancreas cystic tumor. In the operation finding, about 3.5×1.5 cm sized well encapsulated mass was found in the pancreas uncinate process with exophytic growing. The operation time was 150 minutes. Microscopic findings showed the characteristic pseudopapillary pattern of SPT. The result of immunohistochemical staining was positive staining for beta-cathenin, vimentin, and CD10. Finally, the tumor was diagnosed as SPT of the pancreas. The patient was discharged on the 4th postoperative day and there was no evidence of recurrence in the follow-up period of 12 months. Conclusion:. With experienced hands, laparoscopic resection of benign pancreas tumor appears to be feasible and safe even in children.